I need a way to roll-up multiple rows into one row and one column. I know I can roll-up multiple rows into one row using Pivot, but I need all of the data concatenated into a single column in a single row. In this tip we look at a simple approach to accomplish this. The solution proposed in this tip explores two SQL Server commands that can help us achieve the expected results. The commands to be used are STUFF and FOR XML. Before we begin, we'll create some tables and sample data which the following script will do for us. Before going to the examples, we need to understand the workings of the commands mentioned above. The STUFF() function puts a string in another string, from an initial position. With this we can insert, replace or remove one or more characters. Here is an example of the how to use the STUFF command. To do this we can use the STUFF command as follows to replace the first ; in the string with an empty string. The FOR XML clause, will return the results of a SQL query as XML. The FOR XML has four modes which are RAW, AUTO, EXPLICIT or PATH. We will use the PATH option, which generates single elements for each row returned. If we use a regular query such as the following it will return the result set shown below. If we take this a step further, we can use the FOR XML PATH option to return the results as an XML string which will put all of the data into one row and one column. Now that we see what each of these commands does we can put these together to get our final result. The example query below uses a subquery where we are returning XML data for the USR_NAME from table USRS and joining this to the outer query by SEC_ID from table SALES_SECTORS. For each value from the inner query we are concatenating a ";" and then the actual value to have all of the data from all rows concatenated into one column. We are grouping by SEC_NAME to show all USERS within that SECTOR. The below is the output for this query. We can see that we have the leading ; in the SECTORS/USERS column which we don't want. In this modified example, we are now using the STUFF function to remove the leading ; in the string. 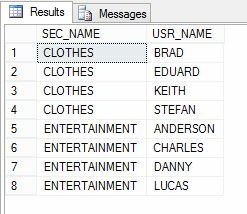 This example takes it a step further where we have multiple subqueries to give us data based on USERS within CAMPAIGNS within SECTORS. There are always several options to complete a task within SQL Server and we should take the time to explore the capabilities offered by the database before developing large and complex code. I hope this is one more of those examples that shows there are sometimes easier approaches than you think might be available.